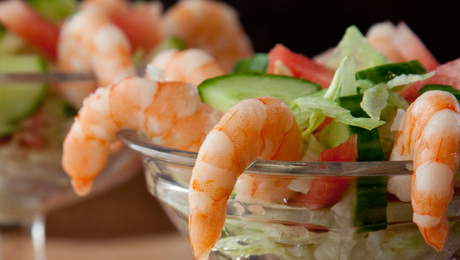 SuperValu's cooked King Prawns are peeled, tailed and ready to eat, which makes this easy recipe even simpler. You could try replacing the prawns with cubes of cooked turkey breast, but go heavier on the olive oil and easier on the lime juice, only adding it at the end and only if you think the flavours can handle it. Separate the lettuce leaves and lay them out out on a serving tray. In a mixing bowl, toss the prawns in a little lime juice and season lightly with sea salt. Set aside while you finely chop the mango flesh, chilli, red onion and coriander. Add these to the prawns and toss to mix well. You can add a little light olive oil if you feel it needs it, and some extra lime juice to taste (or serve with small wedges of lime if you prefer). When ready to serve, simply spoon a little into each lettuce leaf.